With this angling permit you can fish in the sea areas controlled by Metsähallitus between Virolahti and Tornio using a fly or a lure. The permit area contains approximately 37 000 hectares of water areas at sea. 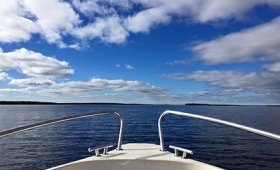 However, the angling permit does not grant the right to fish in private waters (e.g., waters owned by a joint ownership association), Metsähallitus' other angling destinations (former recrational fishing destinations), public sea areas, joint permit areas, rental waters with full fishing rights or in specialty waters. In this context, a family consists of children under 18 years of age and their parents/legal guardians. Married couples and couples in a civil union may also purchase family permits. weekdays from 9 AM to 4 PM. You can order your fishing permit by phone from the automated number. Simply dial the number for the permit you want and enter the four digit number of the desired fishing destination. 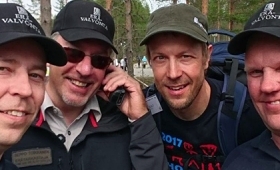 The call must be made from a Finnish mobile subscription. The call is charged on your mobile phone invoice. Read the permit terms of Metsähallitus. Please note that mobile permit purchases are limited to 200 euros a month and to 2 purchases per day per mobile phone plan. You can find the most essential sea areas included in the angling permit at the Retkikartta.fi map service. The angling permit does not grant the right to fish in private waters (e.g., waters owned by joint ownership associations), Metsähallitus' other angling destinations, public water areas of lakes, joint permit areas, rental waters with full fishing rights or in specialty waters. The fisher is responsible for finding out about the possible separate fishing restrictions and minimum catch size regulations in effect at the different fishing destinations. For more information on the destination-specific restrictions related to the angling permit, see the "Area restrictions" tab in the destination description. The permit only becomes valid when it is paid for. 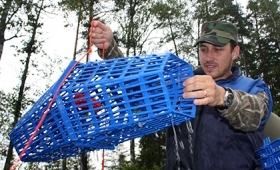 The fisher must keep the permit and the receipt of its payment on their person while fishing and these documents must be presented to a supervisor authorised by Metsähallitus on request. The permit holder (= person whose name is written on the permit) is responsible for the fishing activities that take place using the permit. The fisher is responsible for ensuring that their fishing activities are permitted and legal. The permit may be cancelled if its terms are breached. In addition to purchasing the angling permit from Metsähallitus, fishers aged 18–64 must also pay the state's fisheries management fee if the fishing consists of more than hook and line fishing or ice fishing. Once you have finished fishing, you must submit a catch report at www.tuikki.fi. The angling permit is family-specific. In this context, a family consists of children under 18 years of age and their parents/legal guardians. Married couples and couples in a civil union may also purchase family permits. Lure, fly and worm or grub in whitefish fishing. The number of rods/lines is limited to 8 / permit. Södra Viken 15.3. – 15.6. 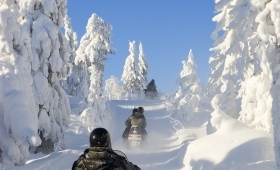 The surroundings of Synnerstberget between 1.4. – 15.8. 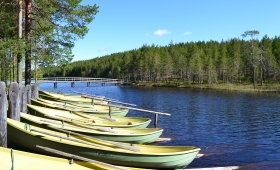 The angling permit contains the right to keep a boat on the forestry land of Metsähallitus. The boat must have its owner's name on it and the owner is responsible for keeping their boat site clean. Remember to find out about any special rules national parks might have on such issues as moving around, coming ashore and making fires! This information can be found at www.luontoon.fi, for example. Grayling is completely protected in the Baltic Sea. Natural brown trout with adipose fin is protected throughout the year in the Gulf of Finland. In recreational fishing anglers may catch 2 salmon/day/person. Natural trout with adipose fin: 60 cm in sea areas outside of the Gulf of Finland. Planted trout without adipose fin: 50 cm. Salmon: 60 cm with the exception of the Bay of Bothnia north of the 63 30 N latitude where the minimum catch size is 50 cm. Note! The local ELY Centre may decide to lower or raise the minimum catch size for their area, so always remember to check the minimum catch sizes prior to fishing.